America's First Gas Turbine Cars! 2. Has an engine that weighs only about half as much as a conventional V-8 yet the 140 horsepower it delivers to the driveshaft is equal in performance to a 200-hp piston engine. 3. Is self cooled by its own air so you never have to worry about filling the radiator (there isn't one) or antifreeze (none is needed). 4. Has only one spark plug and only about 1/5 as many moving parts as conventional engines-think what that can mean in reduced maintenance, tune-up and repair costs. 5. Starts instantly, even in the coldest weather, and needs no warm-up. Chrysler Corporation has already begun building a Turbo Car that will offer all these advantages! How practical are Turbo Cars? In a 3100-mile cross-country test completed New Year's Eve, the Dodge Turbo Dart averaged 52 miles per hour under all driving conditions-from city traffic to turnpikes, through mountains and deserts. With diesel fuel, this engine has averaged over 19 miles per gallon while driving at constant speeds. What kind of performance will they give you? The low-speed, high-torque characteristics of the gas turbine give it unusually quick acceleration. As one automotive editor wrote after driving one of these cars, "To go, you press on the gas pedal. If you press hard, hang on to your hat ... I caught my breath at the acceleration." A gas turbine rated at 140 horsepower on the test stand provides performance comparable to that of a 200 HP piston engine. Good question. The Turbo-Car, as developed by Chrysler Corporation, is a practical car today-but is still probably a number of years away from mass production. 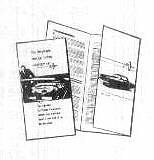 Consumer interest in the car has been so intense, however, that we have decided to build 50 to 75 turbine powered cars which should be available to selected customers late in 1963. 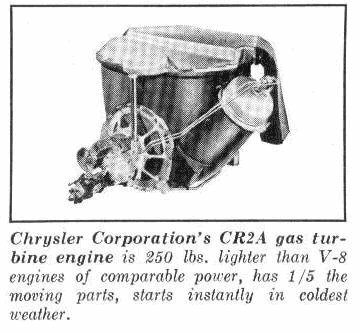 You can get more detailed information on the Chrysler Corporation Turbo Car in a free booklet entitled: "The remarkable Gas Turbine Passenger Car." Hundreds of thousands of people across the country already have a copy. Pick one up soon at your nearby Chrysler, Dodge or Plymouth dealer.